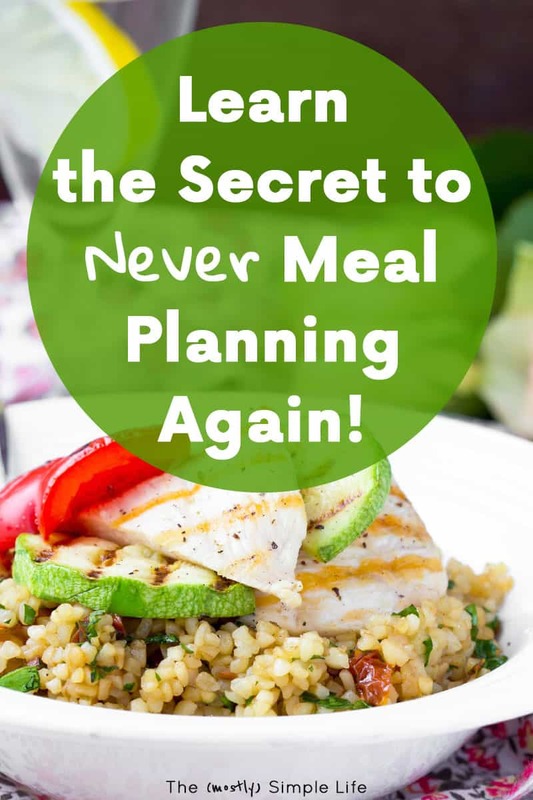 You know that I am all about meal planning to save money, save time, and save your sanity (when you’re starving and still have to figure out what there is to eat). I get that not everyone geeks out about planning their meals as much as I do, so I want to give you the opportunity to cheat! Haha, ok actually it’s not cheating. It’s just being smart! If you know something is not one of your strengths (or you just don’t have the time or energy for it) and you can pay someone to do it for you… why not? Especially when it’s super affordable. I want to share $5 Meal Plan with you! I’ll explain the service, share my experience with it — what I love and don’t love, and help you decide it it might be for you. You can get a free 14-day trial of $5 Meal Plan here! How Does $5 Meal Plan Work? As a member, each Friday you’ll get an email with the next week’s meal plan which includes the menu for the week plus your grocery shopping list. You’ll download it and you can print it out of you want to. Five dinner recipes. There is always one that you can make in a slow cooker, one that is freezer friendly, and one that only takes 20 minutes. A random recipe: either a dessert, beverage, or snack — something fun! They aim for each meal to cost less than $2-3 per serving, making it budget friendly. Here’s where it get super cool… You also have access to their meal plan builder. So say you weren’t thrilled with one of the dinners included in this week’s menu. You can go into the meal plan builder and modify the menu by swapping out the recipe you don’t like with any from their recipe library (it’s huge). You can also start from scratch and build your own menu from their library. Recipes can be sorted by cooking method, ingredient, and dietary preference, so you can find exactly what works for you. Once you have your modified or custom meal plan, it compiles the grocery list for you, just like with the weekly plan. Then it’s ready to download and print! I absolutely love the meal plan builder. I don’t consider us picky eaters, but sometimes I know a certain meal won’t be to our tastes. I can swap out that meal with one I know we’ll enjoy. If I have a busy week, I can choose more slow cooker meals. If I got a great deal on chicken and eggs, I can choose meals that use those ingredients up. I wanted to give you an inside look at the membership site so that you get a better idea of how $5 Meal Plan works and what it all looks like. Watch the video below for an inside look. It’s called $5 Meal Plan for a reason, my friend! For only $5 per month, you get a new meal plan every week. Honestly, I find the price mind-boggling. I would still think it was a good deal if it was $5 per week for the meal plans, but it’s $5 per month! That’s about $1.25 each week to have a meal plan and grocery list sent to you, ready to use. You still have to cook! Haha, that’s really one of the only drawbacks. Luckily, it’s not a significant amount of time in the kitchen. Most meals seem to average 10 minutes of prep work and between 15-30 minutes of cook time. You also still have to shop. 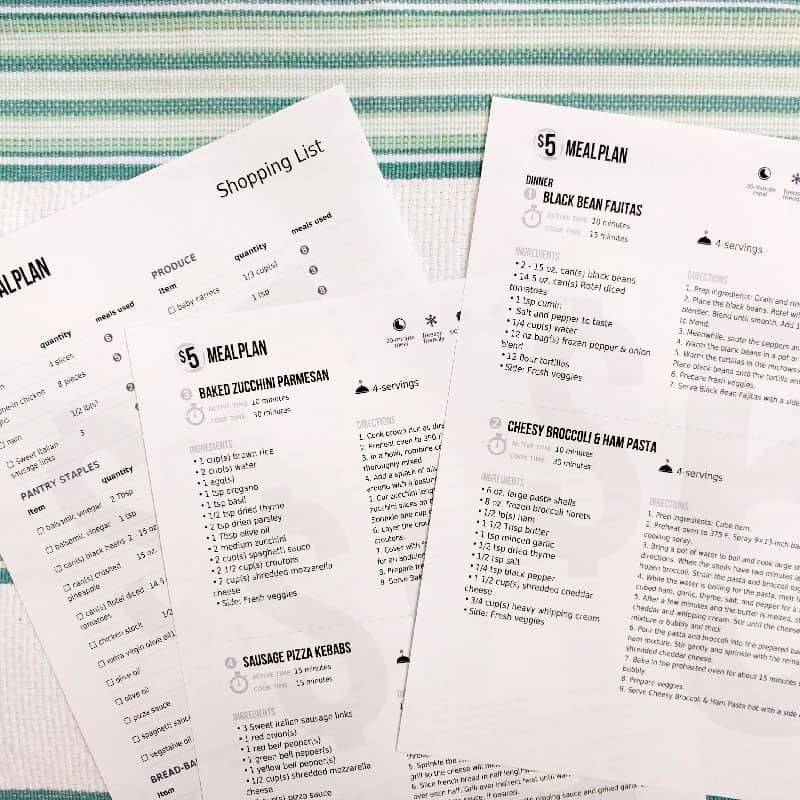 Since it’s a weekly meal plan, you’ll be able to shop just once a week. Pro Tip: If you use curbside grocery pickup or grocery delivery, you can avoid the store completely! If you have a large family, you may need to make some adjustments to the plan. Most of the recipes say that they make four servings. For the two of us, that’s just fine because there are leftovers to eat for lunch the next day! Don’t like a particular recipe? Modify the week’s menu and swap in a different one. Dealing with tricky dietary preferences? There is a gluten free plan each week, plus a whole bunch of dairy-free, soy-free, gluten-free, or vegetarian recipes in the meal plan builder library. The Price. I have to mention it again. I literally triple-checked their website to make sure I understood, because it seems like too good of a deal. For $5 per month, you get a new meal plan every week! The Options. Most meal planning services and meal kit deliveries don’t have a lot of good options for those with food allergies or dietary preferences. There is a gluten free version of the meal plan every week. Plus, the meal plan builder lets you sort by dairy-free, soy-free, gluten-free, or vegetarian recipes. The Meal Plan Builder. The fact that you can modify each meal plan to your tastes or create your own from scratch is just awesome! It’s easy to use and still compiles your grocery list for you. It might be my favorite feature! The 14- Day Free Trial. You get to try out two weeks of meal plans for free with the trial, which is fabulous! You do have to enter your payment info for the trial, but they send you an email to remind you when your trial period is almost up and your card is about to be charged — that’s a classy move. They don’t want you forgetting about it and paying on accident. How Do I Know If $5 Meal Plan Is For Me? If you want to eat at home more. Having the meals planned and the groceries you need is one of the best ways to get yourself to eat more at home. If you want to save money. For only $5 per month, I’m guessing you’ll spend way less money on groceries and eating out because of these plans. If you’re busy. The planning is all done for you! You just need to do the grocery shopping. Or have your groceries delivered to save more time. If you can’t seem to get the hang of meal planning. If you’ve tried over and over again or it just seems to take you too much time and energy to figure out your meal plan, outsource it! If you’re in a food rut. Even though I have my own easy system for meal planning, I sometimes find myself getting sick of our usual meals. 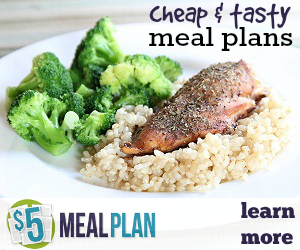 $5 Meal Plan is great for helping me try new recipes and mix things up. 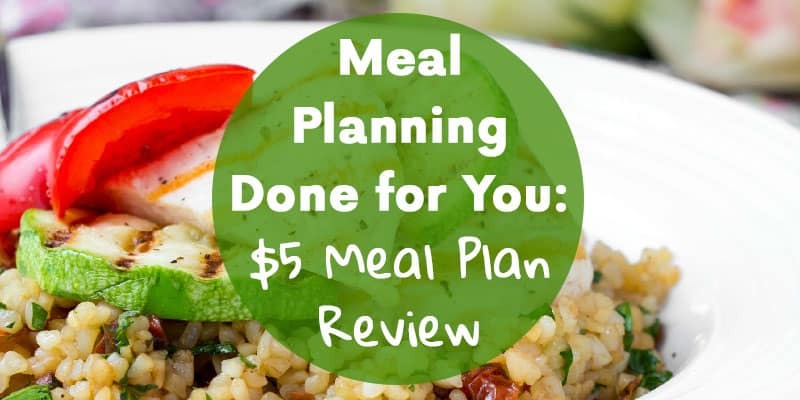 $5 Meal Plan is a great service that takes care of meal planning for you! They even give you the grocery list you need so that you can get your grocery shopping done quickly. It is so affordable and customizable. With a 14-day free trial, there’s not really any reason not to give it a go and see what you think! Wow, this is actually an incredible deal! I don’t eat out much, so I cook the majority of our meals, but as you say you get tired of the same recipes sometimes, no matter how awesome they are. I will have to check this out! Yes! It really is a crazy-good deal! I don’t mind that we eat the same few meals over and over, but every once in a while I have a major need to mix things up.